Meanwhile here in NYC the DOE and the UFT say there "are no more rubber rooms". NOT true. Also, my statement for the record is that I define "rubber room" as a part of a process which has certain designated people falsifying facts to make someone guilty of acts they did not commit. 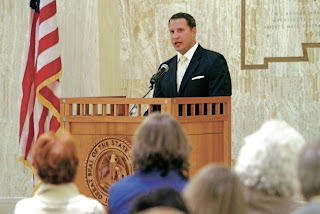 Extending the superintendent’s contract, concerns over site-based management of schools, preserving the district’s music program and rumors of a “rubber room” where teachers placed on administrative leave go to pass the time were topics brought up during the public forum at Tuesday night’s Santa Fe school board meeting. The existence of a so-called rubber room was raised at the Feb. 6 meeting, as well. The term originated with the New York City school district, which set up venues where hundreds of teachers on administrative leave reported until their cases were resolved. Superintendent Joel Boyd called it a “pejorative” term that raised alarm, and he emphatically denied there was such a thing in the Santa Fe school district. At the same meeting, Bernice Garcia Baca, president of the local teachers’ union, said she wasn’t aware of one and that if there were such a thing, she’d probably know about it. But on Tuesday, Baca said she had learned there was one person who has been on administrative leave and is voluntarily reporting to the B.F. Young Building until the case is resolved. She said the practice is not mandatory under the collective bargaining agreement and was a matter that could be addressed during negotiations. “If we’re in the discussion, maybe we could give a viewpoint administration may not know,” she said. During the public forum, two people addressed the issue of a rubber room. Cate Moses, an outspoken critic of Boyd and board member Glenn Wikle’s girlfriend, insisted there is a rubber room, just as she did at the Feb. 6 meeting. “There is a rubber room. I’ve seen it with my own eyes,” she said. Moses said if Boyd believed creating a rubber room was a good management practice, he should admit it. John Trentacosta chastised the board for “mocking” the term at the last meeting. “We’re talking about people’s careers here,” he said. Trentacosta, a music instructor for SFPS, said teachers’ morale is low and they are afraid to talk about it publicly. Neither Boyd or any member of the school board responded to the comments. Lorraine Goldman, Trentacosta, Barbara Fix and Catherine Bueler each made pleas to the board to keep the music program in place during the district’s secondary school reform effort. Some of their comments also related to site-based management, which was on the agenda for a presentation. Goldman said she was concerned that a movement toward site-based management could put the programs at risk. She said putting decisions in the hands of principals could jeopardize the program at some schools, because they are often not experts in that area. She said she hoped the public would be able to participate in discussions having to do with the future of the music program. “In a time of budget crisis, people who know what’s going on – who know what works and what doesn’t – should be a part of the process,” she said. Moses and Baca also commented on the superintendent’s contract, which was on the agenda as an action item. Moses said it was far too soon to be considering extending the contract of the superintendent, who came on board Aug. 1, 2012. Board members spent about three hours in executive session discussing Boyd’s contract. When they came out, they voted 4-1 to extend Boyd’s contract into 2016. The Santa Fe school board voted 4-1 toward the end of Tuesday’s meeting to censure member Glenn Wikle, charging him with violating unnamed policies. Wikle said the disciplinary action was related to his efforts to find out whether the district has created a so-called “rubber room,” where school employees accused of misconduct await resolution of their cases. The room is rumored to be located in the district’s B.F. Young Professional Building on Camino Sierra Vista, though Superintendent Joel Boyd and other district leaders have denied it exists. “One of the reasons I am being censured tonight is because of a surprise visit [to B.F. Young] to take a look at that room … because I am passionate about how teachers are treated as employees of this district,” Wikle said Tuesday night. It is unclear what Wikle found when he looked around there. Wikle also said he was being censured for forwarding an email from a member of the community to a school principal without copying the superintendent. During the school board election campaign, candidate David Zimbler, whose wife works for Santa Fe Public Schools, claimed that the rubber room existed. He lost the election for the District 3 seat to Susan Duncan. And activist/artist Cate Moses, who is Wikle’s domestic partner, insisted at board meetings on Feb. 6 and Feb. 19 that at least one teacher is assigned to the room. On Feb. 6, NEA-Santa Fe President Bernice Garcia-Baca told the board that she had not heard of such a room, but she acknowledged Tuesday that one teacher on administrative leave is apparently performing administrative tasks on a voluntary basis at the B.F. Young building. In many cases, Garcia-Baca said, employees on administrative leave simply wait out their time at home while the district investigates their cases. According to the district’s chief of staff, Latifah Phillips, the district employs about 2,070 people. Of those, 17 have been placed on administrative leave since the start of the school year. Four of those staffers have returned to work. Four resigned. Four were discharged. The other five cases are pending. The board’s action to censure Wikle followed a 4-1 vote to extend Superintendent Joel Boyd’s contract through June 2016. Wikle voted against that measure, and against the measure to censure himself. Recently, Wikle surprised the board by announcing that he was not voting for district’s $130 million general obligation bond in the Feb. 5 election, despite showing previous support for the measure. The announcement drew criticism from fellow board members and members of the public. An article in the Feb. 20 issue of the Santa Fe Reporter noted that Wikle is urging more oversight of the district’s Citizens Review Committee to reduce the chances for conflict of interest among its members. The CRC prioritizes and makes suggestions regarding district facilities to the board. But Tuesday’s vote to censure Wikle is apparently unrelated to his stand on the bond issue. Outgoing board President Frank Montaño said Wednesday that Wikle violated executive-session “confidential matters,” including interfering in a personnel issue. Montaño said the board followed its rules before publicly censuring Wikle. He said he had a private conversation with Wikle, and then the entire board spoke to him in executive (closed) session. New Mexico School Boards Association Director Joe Guillen said Wednesday that in many cases, board censures occur because members have released personal information they gathered during executive session. In New Mexico, he said, censure is an expression of disapproval, and there is no further penalty. “It’s just voicing the opinion of the board on a particular matter, but there are no enforcement proceedings resulting from it,” he said. Earlier this month, the Hollis, N.H., school board censured member Debbie Pucci for comments she made about the district’s special-education services during a public meeting. And last summer, the Burlington, Wis., school board censured member Phillip Ketterhagen, a rancher, after he suggested that the only way to get district staffers’ attention was to smack them with a 2-by-4 as if they were cattle. Contact Robert Nott at 986-3021 or rnott@sfnewmexican.com. School board member Glenn Wilke even went so far as to go to a district building unannounced to see if he could find the room. School officials said the existence of such a room is absolutely not true. The term “rubber room” comes from an incident in New York City when hundreds of teachers accused of misconduct were made to sit all day in rooms while their cases were under investigation. Santa Fe school officials said such a practice would never be the case here. School Board President Frank Montano said it is against school policy for board members to conduct their own private investigations. That, along with other code and legal violations, is why the other board members decided to censure Wilke. That is basically a public way of disapproving of his actions. Censuring school board members is very rare. School officials say it only happens a few times throughout the country every year. “This is a very serious matter and if people understood the details of what he did, they would fire him,” Montano said. Montano said he can’t elaborate on what those details are because that would violate confidentiality restrictions. Wilke has been a board member since 2011. He didn’t return Action 7 News calls or emails. When we went to his office, he refused to speak with us.